We got out early this morning, caught bait, picked the guys up before daylight then went looking for fish. I went to set up pulling a large mid lake flat so we stopped about a hundred yards prior to the flat to get our baits out. We had only put a couple in when I looked at my Lowrance which was full of fish. The downlines started getting nervous, the boards were rocking, then the guys started running for the hooked up rods. We landed a few fish but this school was the only school we saw for the rest of the day. We worked hard catching a couple fish here and there and ended up having a good day and a lot of fun. 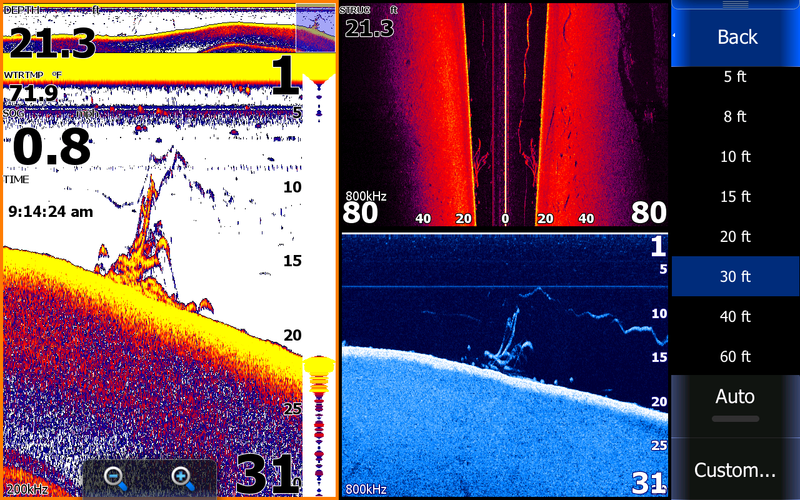 The bottom picture of my Lowrance shows a small group of Stripers on a ledge we went over. A 5 pound Striper hit a downline, Michael fought the fish to the boat and we landed it. You can see in the blue down scan picture the streak off to the right of the group of fish. The Striper came up out of the group, took the bait and as the boat was pulling away from the group Michael wrestled the fish in which is the "streak". Today fish were hugging the bottom in small groups on ledges in 15 to 25 feet of water. Cloudy, drizzle, rain, Water temperature 75* and Clear. Guide Tony took the Jim's out today for a day of "Catching" on the Lake. The bad weather must have kept most boaters off of the Lake which was a good thing, Tony could fish where he wanted to without any boats to spook the fish he was working. As you can see by this heavy stringer the fish are now in their fall patterns and feeding up before the winter hits. They lost count of how many fish they caught but they had a great day. Looks like Jimmy is having a problem holding up his side of the stringer. 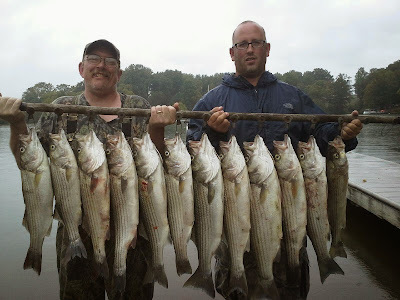 Live bait is the ticket for stringers of Stripers like these on the lake, and this is only the beginning of a live bait bite that will last for many months to come. There are plenty of punks breaking on the lake now for artificial fisherman to cast to but most of the fish are less than 18 inches. Sunny and Beautiful, Water temperature 76* and Clear. The day did not start out on the right note, my clients had to go to another marina this morning to get fishing licenses which made them a little late and we had to throw for bait for 5 hours before we could start fishing. I had mentioned to the guys when I was showing them how to reel the fish in using circle hooks that sometimes when one fish hits they all get hit. Well 10 minutes later while we were still trying to get baits in the water it happened, everything hooked up. This is a great time of year to spend a day out on the lake, cool mornings, beautiful skies, bent rods and good people. Yesterday [Sunday] we picked our clients up at 5 then went and caught bait. We set up over 32 feet of water working a ledge that was holding fish. We made a couple passes on the area taking hits and catching a few Stripers. We were about to hit it again when a guy in a Bass boat who had no clue how to trim his boat out came porpoising right through the small area we were working. Naturally that turned the fish off there so we had to move on to work other areas. Andrew and Gavin are pictured holding the first fish of the day that they caught. The bottom picture was taken on the point at the mouth of pigeon creek. This weekend warrior drove his boat right up over the rip rap and 10 yards up onto the bank! You can see the prop marks going through the rocks and digging out the dirt going up the hill. Hopefully no one got hurt. This and other inconsiderate boaters are reasons to fish during the week, not only is fishing better then but the lake is much safer, serene and enjoyable. I had promised my grandson Michael I would take him out one morning this weekend fishing and expected to take out another dad and son but never heard from them so I called Anthony and we hit the water before daylight. We knew the boat traffic would be horrible so we caught bait and agreed to stay out only for a couple hours because I did not want any drama today with boats. We set up and pulled an area for 100 yards but we did not like it so we wasted our baits and hit another area. We had got our spread out and were ready to hit the juice when I looked up and here came a skier right at us. We were up against the bank but it did not matter to them, they kept coming and circled us for 30 minutes. Michael could of had some fun reeling in a skier but it is a holiday weekend and people are simply clueless when they get around the water. We laughed it off, got our baits in and made another move. This time we set out downlines on some fish I saw on a ledge and hooked up. The first fish was a nice solid 5 pound bass. Michael wrestled it in, Anthony took the fish off and I snapped a picture. Before I could take another shot another rod bent over. Anthony yelled to Michael to give me that Bass and grab the other rod. I threw the Bass overboard as Michael reeled in yet another nice Bass, this one well over 6 pounds. Both Bass were chunky and healthy, obviously they had been eating well. The second Bass appeared to have just spawned, its tail was tore up, red and almost bleeding! We popped a quick pic then released the Bass back into the water where we caught her. Mike asked if he could go swimming because it was starting to get hot and Anthony jumped right up and emptied both bait tanks, we couldn't get off the water quick enough, we knew what the day was going to be like and welcomed the call from Michael to quit fishing. I should have taken a picture on my Lowrance of the Bass, they were stacked up on top of each other right on a ledge in 22 feet of water next to the main channel, text book summertime pattern especially with bluebird skies and massive boat traffic.